paragraphs written for the research proposal of this thesis. 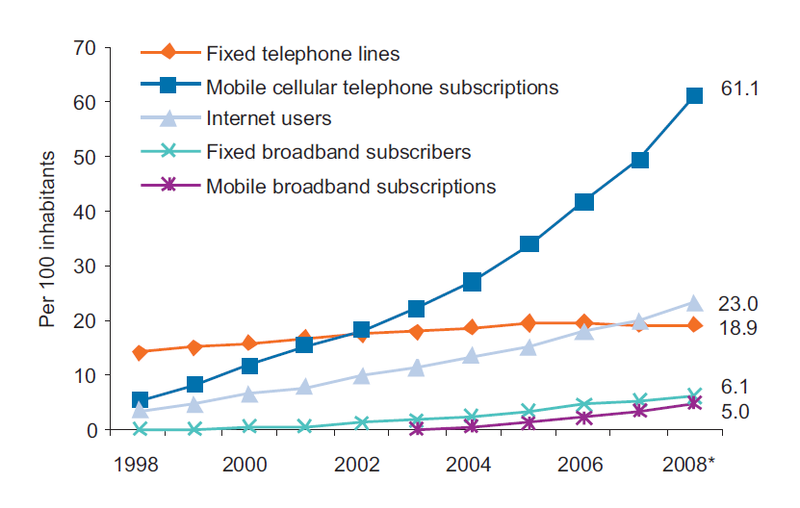 The current text presents statistical information about the usage of mobile phones worldwide in terms of number of mobile phone subscribers and provides a very short analysis of those numbers. predominant technologies for information exchange. 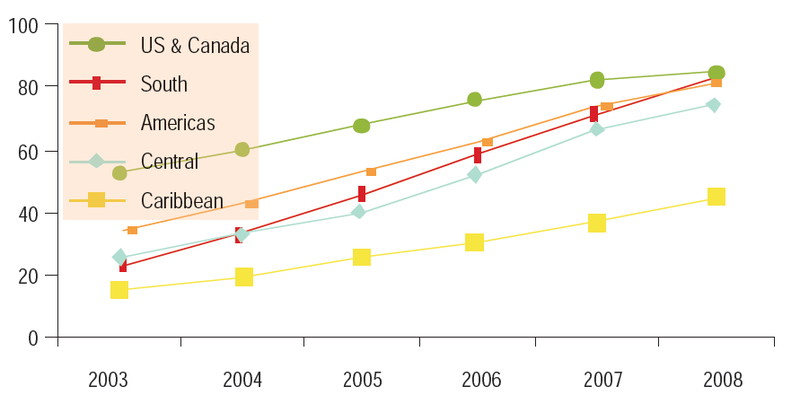 magnitudes between 2002 and 2007.
information society : the ICT development index. one note of caution about these statistical numbers must be issued. numbers could be lower by 10% (Gillwald and Stork, 2008). the connected and the disconnected seems to fade out just slowly. high costs of services compared to income. exceptions are Korea, China and Vietnam (ITU, 2009c). Panama or Argentina (ITU, 2009b). may also impose another perspective on the digital divide. 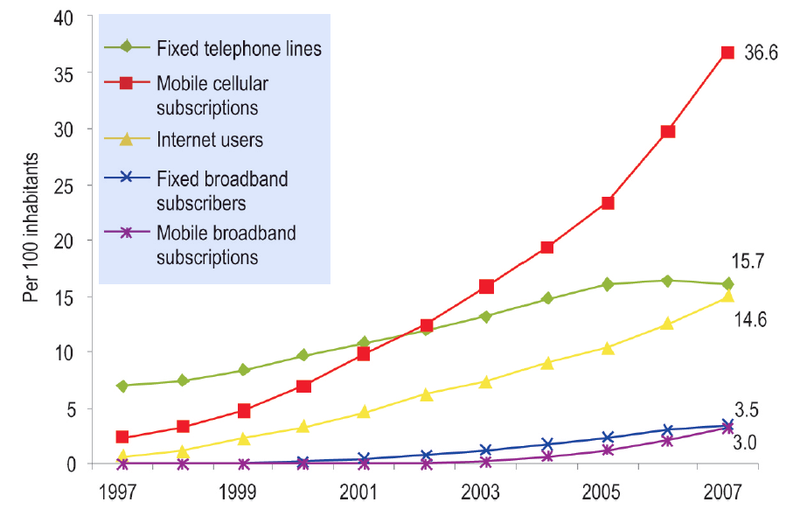 disconnected even without subscription (Ekine et al, 2009). Blycroft, 2009. 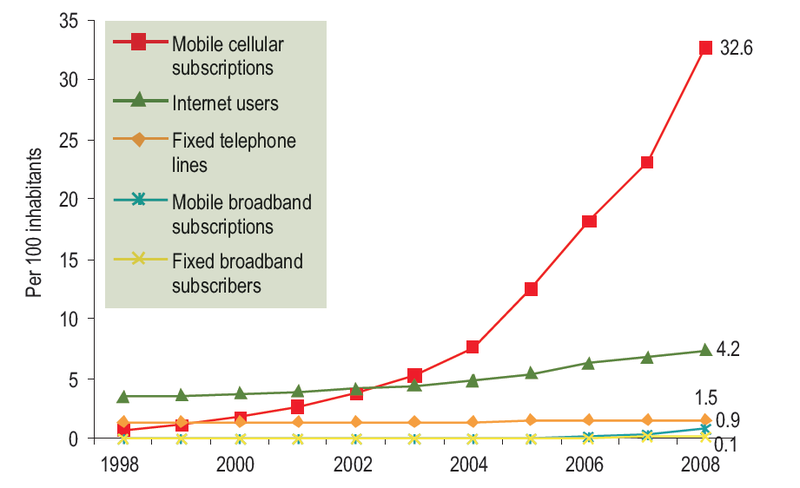 The Africa & Middle East Mobile Telecoms Market in Figures 1H 2009. Available at: http://www.telecomsmarketresearch.com/reports/Africa_Mobile_Databook_1H2009_REDACTED.pdf [Accessed February 26, 2010]. Campbell, S.W. et al., 2007. Mobile Communication and Society: A Global Perspective. 2007. Available at: http://ijoc.org/ojs/index.php/ijoc/article/view/189/99. Gillwald, A. & Stork, C., 2008. Towards evidence-based ICT policy and regulation : ICT access and usage in Africa. Available at: http://www.researchictafrica.net/new/images/uploads/ria-policy-paper_ict-access-and-usage-2008.pdf [Accessed February 25, 2010]. Hersman, E., 2009. 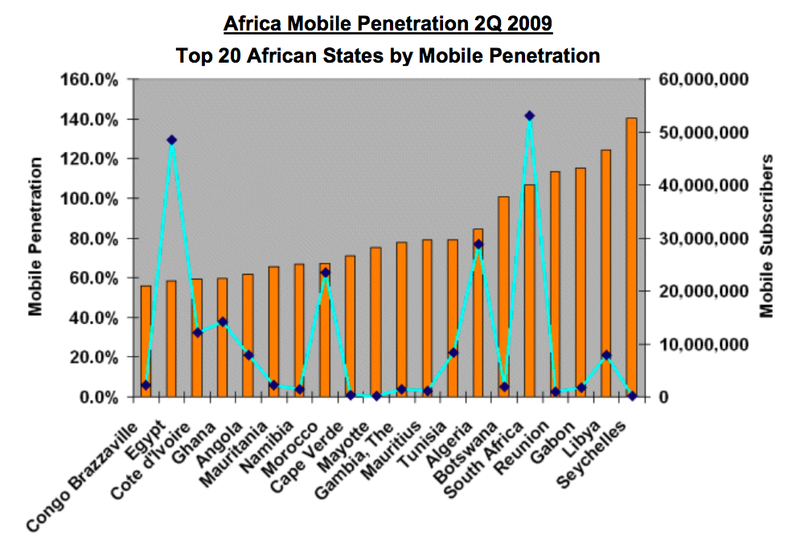 African Mobile Market, Q2 2009 Numbers. WhiteAfrican. Available at: http://whiteafrican.com/2009/11/24/african-mobile-market-q2-2009-numbers/ [Accessed January 7, 2010]. ITU, 2009a. Information Society Statistical Profiles 2009 – Africa. Available at: http://www.itu.int/dms_pub/itu-d/opb/ind/D-IND-RPM.AF-2009-PDF-E.pdf [Accessed December 26, 2009]. ITU, 2009b. 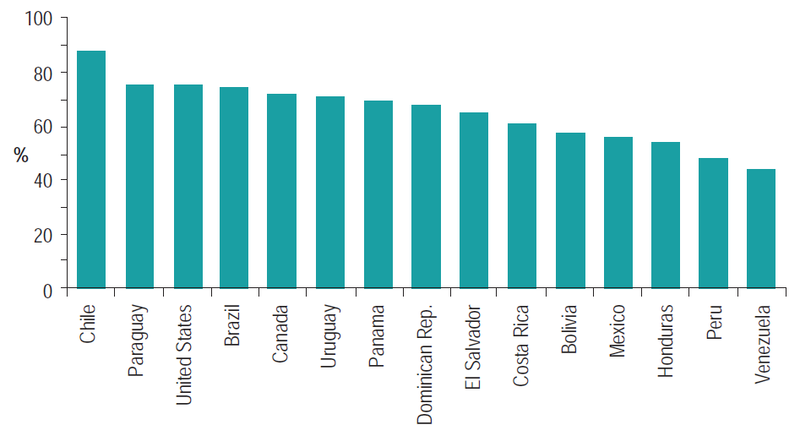 Information Society Statistical Profiles 2009 – Americas. ITU Publications. Available at: http://www.itu.int/publ/D-IND-RPM.AM-2009/en [Accessed February 20, 2010]. ITU, 2009c. Information Society Statistical Profiles 2009 – Asia and the Pacific. ITU Publications. Available at: http://www.itu.int/publ/D-IND-RPM.AP-2009/en [Accessed February 20, 2010]. ITU, 2009d. Measuring the information society : the ICT development index., Geneva: International Telecommunication Union (ITU). Available at: http://www.itu.int/ITU-D/ict/publications/idi/2009/material/IDI2009_w5.pdf.